June 15th is an evening that we will always hold dear to our hearts. All of our attendees were welcomed with open arms to come as they are - whether they have just gone through the hardest season of life to date, or are the happiest they’ve ever been. It was a night of reflection and learning, but the common theme through every one of our five speakers was to embrace every part of YOU and to leave with a greater feeling of acceptance and hope. Our 'Let’s Get Real' Events are a different kind of conference, they aren't just about listening-- They are about experiencing what it means to be bona fide for yourself as well as a chance to share your story. Through group discussions, a mindfulness yoga flow, bona fide confessions and more, it is an outlet where you don't have to be anything but yourself. When we host our Let’s Get Real events, we don’t want it to be a place where you come alone or with a friend and leave alone or with your friend. We want it to be a place where you can band together and meet a new sisterhood, make new friendships and create a community of support that has the capability to last a lifetime. One of the first things our guests are asked to do upon arrival is to fill out a “Bona Fide Confession”. This gives each of them an opportunity to express and show others that we are more than just a person. We have fears, we have struggles, we have quirky things about us and there are many others out there who completely relate. 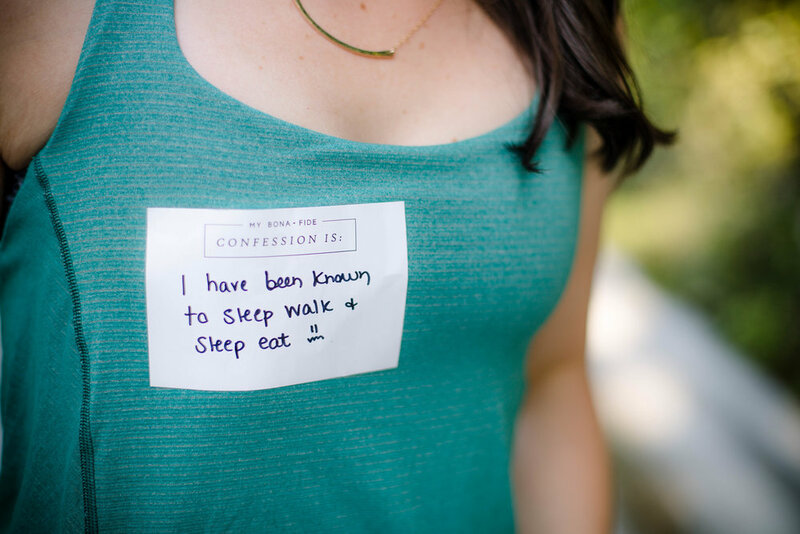 Instead of just writing a name on their name tags, we have everyone write a confession, which is always a great conversation starter! It is incredible to see how many people are in the same boat or will understand you more when you open up, overcome your fear of what people will think and share more of yourself. You have no idea the value your story holds. The night began with Courtney Barr leading us in a guided meditation and self-restorative yoga flow. We were reminded to put our phones away and see and feel the importance of being present through our day to day lives. It is so easy to get caught up the busy-ness of this world and forget that the real beauty comes in simple, everyday moments. Ashley Lemieux was our ever inspiring emcee for the evening, where she not only announced our fabulous speakers but also kept the audience engaged with small activities and also shared snippets of herself with bona fide words about her personal trials and triumphs. Ashley reminded us that we each have a light with some serious impact and the world needs more of it. A favorite quote of the night was that “good things are coming and your story is being built in a way you couldn't even imagine”. 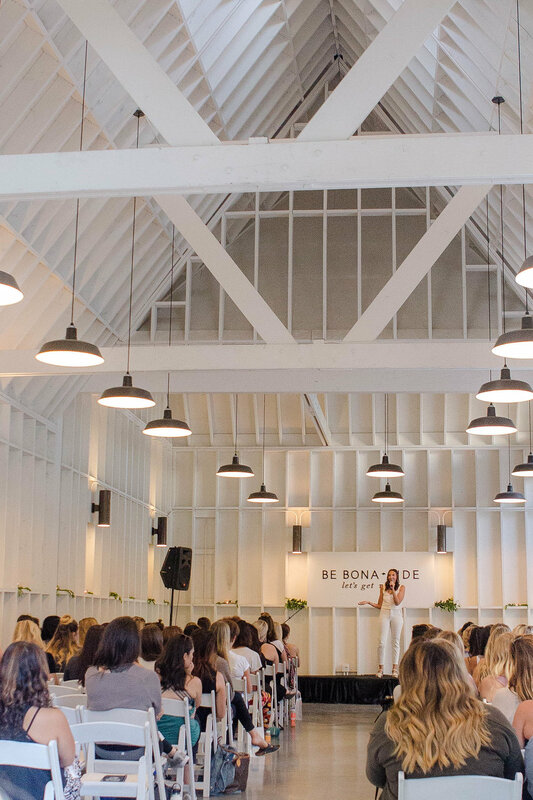 Nicole and Laura, the founders of Be Bona Fide told their story of how this movement began. They shared how they turned their surface level friendship into each others confidant and supporter through vulnerability. They shared three things that they learned on their journey to be more vulnerable and bona fide. 1) Overcome your fear and have courage to open up. 2) Start somewhere by writing it down or talking to someone you trust. 3) Exercise your vulnerability like a muscle. Next, Sarah Sappora brought strength in the words to wake up with the motivation to “be greater” than the previous day. No matter how much we weigh, how old we are, or however we feel we "messed up" in the past. She expressed that you don’t have to get it right, you just have to strive to be greater tomorrow. She left us feeling inspired to live each day with a zest to find out what our personal BE GREATER is and reminded us that we are all on our a different path, there is no need to look back or to the side, look forward and work hard for what is most important in life. She is a self-love promoter and wellness advocate with a keen ability to talk about hard stuff. Sarah helped us all commit to our own journeys to living a healthier, happier life and being okay with getting back up and trying again. As we transitioned from our yoga mats to dinner served by Locali, we mingled outside and new friendships were formed through the commonality of being real. Drinks were provided by Suja Juice. Perfect Bar and Lolli & Pops were also their handing out the most delicious bars and treats as well. Mouth watering dessert was provided by Simply Brigadeiro. Jacqui Saldana shared her story of when her world was turned upside down and how she was able to come back from the heartbreaking tragedy of losing her son. Jacqui spoke about how to channel your courage and the power of sharing your story. Our favorite quote from Jacqui's talk was "It takes courage to share the things that aren’t so pretty or things that don't add up to create a perfect IG feed. I’d encourage you do channel your courage and share whatever you are going through. Because you’ll end up helping those around you. Honest. Sharing our trials and tribulations connects us and creates a safe community where we can be ourselves." 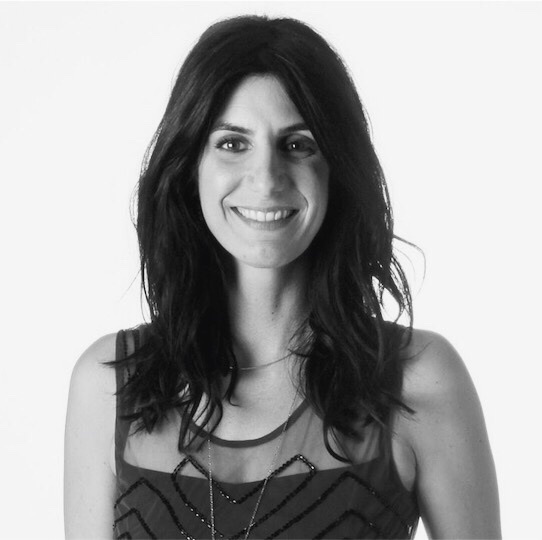 Katie Wilcox of Healthy is the New Skinny really opened up our minds to dig deeper, past the advertisements and false expectations of what a woman should look like based off of society. She lead most of her talk in a discussion, involving the audience in the topic of body image and how we can look past the advertisements and see our true worth. We left feeling uplifted with a new sense of confidence in our own skin. We ended our speaking portion of the night with Brooke White from Girls with Glasses who was real, inspiring and hilarious all at the same time. She focused on 10 things she had learned that set her soul free. She reminded us that comparison is a trap - that there is only one you, so make the most of ourselves. A favorite quote from Brooke was that "we can’t do what they do, so all you have left to do is connect". That connection is our choice and with that choice we have the opportunity to find ways to connect to people. These stories left us feeling overwhelmed with hope and new insight. Following after, everyone headed out to the lawn with twinkle lights strung across the sky, blankets, the sweet aroma of candles by Candlefish and comfy pillows from Folklore Rentals. 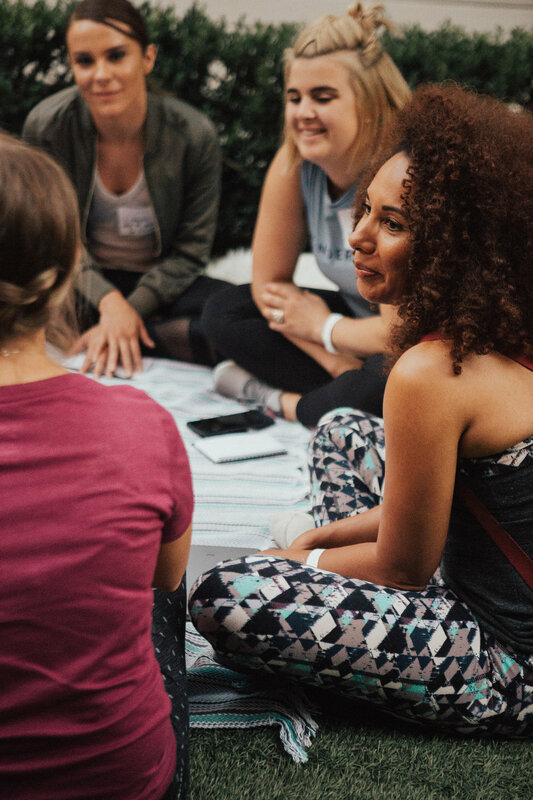 Our small group discussions were lead by compelling and influential women in the LA community, each woman had the opportunity to share her our own journey and discuss the role of social media and how it has played a role in their lives. We heard so many different takes on what it means to be bona fide in a culture striving for perfection and were so encouraged by those words. Every single person at the event has given us fuel to keep this movement alive. We are forever grateful for all those that brought their light and trusted us with our vision. We know events will never be easy but strongly believe that this LA event taught us something we needed to learn for the future. 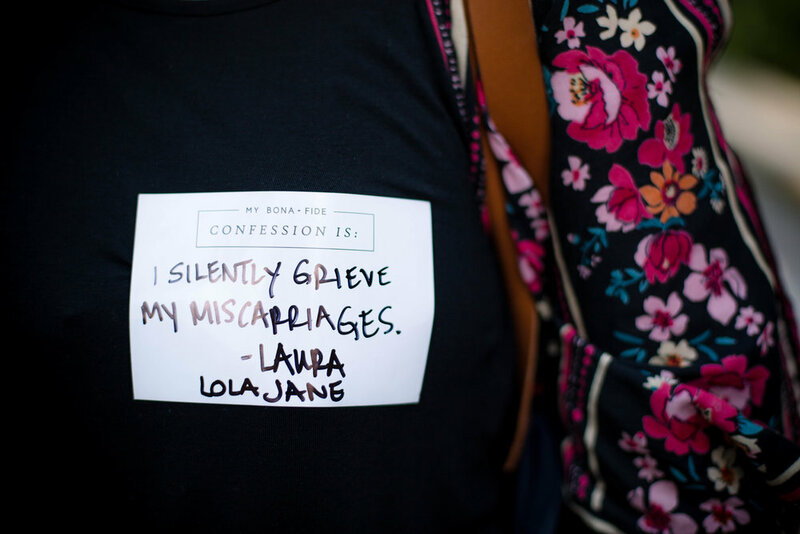 We learned so much from that night and cannot wait to bring this message to more cities with hopes that more women will feel the value in our movement. Again, we cannot thank all those involved enough for supporting us when we needed it most. Hope to see y'all at the next event in the Dallas area this fall! Nicole (right) is a mommy to be in August! She is the Public Relations and Marketing Director for Be Bona Fide. Baby Boy Bakery is an ever growing space dedicated to my son Ryan Cruz. My name is Jacqui and I started my blog Baby Boy Bakery when my son was just a few months old to capture all our life’s moments; the good, the bad, the mundane and our favorite, the delicious. Our blog centered around recipes that I created with my son and stories of my motherhood journey. My husband Dan and I lost our three year old son in May of 2014. Since losing Ryan, Baby Boy Bakery has become a space where many come to learn about our story and how we dedicate everyday to our son. Now, Baby Boy Bakery strives to be a destination were people can come for delicious kid-friendly recipes and inspiration to live a loud and wild life no matter the ugly we are faced with. Ryan was such a bright and loving light. You can see it stream through his smile. Now that he is physically gone I want to continue his legacy as best I can through this beautiful online space we created together when he was just a baby. BONA FIDE CONFESSION: "I love saying 'I can't make it' so I can just stay in bed with ice cream & Friends reruns. Also, I'm always happy. But a lot of times I'm smiling through my pain." Founded in 2011, Healthy is the New Skinny (HNS) began as an online blog and over the years has transformed into a clothing brand and social media campaign that promotes positive body image and lifestyles for women all over the world. HNS has been featured in a variety of publications including: Fox News, People Magazine, and the New York Post. In addition, HNS has been heralded as one of the top social media pages to follow for body positivity according to MTV and Marie Claire. Using Healthy is the New Skinny as her platform, Willcox speaks out against harmful advertising and encourages people from all over the world to model healthy body image and self-love by living an authentic healthy lifestyle. As a public speaker, Willcox aims to educate, inform, and empower girls and women to rise up against media manipulation and teaches them how to protect against it. BONA FIDE CONFESSION: "I've never been happier and healthier in my entire adult work-in-progress life, but I still struggle with the changes in my body. I make a conscious choice every day to accept and be peaceful with who I am, where I am." Hi my name is Brooke White, I'm kind of a goober but I love life. I'm a major over-analyzer, slow poke, HSP (highly sensitive person) and recovering perfectionist. As the eldest of 4 and was raised in a music loving family in the hot desert land of Mesa, AZ. But, I always knew I would end up in California to be closer to Mickey Mouse, the beach and the land of dreamers! So I packed up my jeep and moved here when I was 20 in hopes of finding out who I was and becoming a singer-songwriter. As you can imagine it wasn't easy being a starving artist! After a handful of years spent chasing the dream, writing songs, cutting hair in her bathroom and nannying twins, I finally landed one giant crazy break when I was granted a golden ticket to perform on seasons 7 American idol. I truly felt unworthy of the show and almost died of a no-confidence attack, you could find me crying and hyperventilating in a bathroom stall of CBS studios almost daily. I struggled to compare myself (like I always have) to the other contestants and their super impressive voices. I grew up wishing I sounded like the little mermaid, but pretty much sounded like Barry White with my low raspy voice. I would go on to dislike the sound of my voice for most of my life. Despite my nearly paralyzing self doubt, I learned to just keep going, and that it isn't about competing and comparing, but connecting and other solid life lessons. By some wild miracle, I managed to finish in fifth place! Holy Moly! After the show I went on tour with the top ten, touring the country, coming up through the floor on a grand piano night after night in sold out arenas. I kinda can't believe that it happened to me and don't take it for granted. After the Idol ride I have tried my absolute darnedest to chart my course as as a relevant indie artist in the entertainment industry. Also hard. I started my record label "June Baby Records" (i was born in june:-) and I've released 7 records including 3 EP's and a full length record with my indie fold rock band, Jack and White. I've played to full rooms, I've played for empty rooms. I've done some other funny interesting stuff I never thought I'd do, like host the red carpet for TV guide, judged Miss America alongside Rush Limbaugh (true story!) and did some acting in a couple of made for TV movies, it was incredibly fun! These days you usually can find me on The Girls With Glasses Show a fun youtube channel and lifestyle series alongside my super talented BFF and partner in crime Summer Bellessa. Most of the time were working on some kind of silly parody or music video for liquid Plumber or something. Its crazy but we have fun and even make a living as creative moms. It's all pretty wacky that this has been my life! As for me and my man Dave Ray CPA (thats what I call him) my complete polar opposite from Nova Scotia, we've been married for over 13 years. I'm proud to say we have come a long way. I find marriage to be my biggest learning opportunity. I am thankful to him for loving and supporting me through my insanity. After an unexpected 8 year wait and a big surprise, we welcomed our first child, London, who is the coolest little free spirit we call "Londy Loo" in May 2012. A month later I turned 29. We looked forward to expanding our family. But after a couple years of trying, miscarrying and just not getting pregnant, we realized we had a serious problem. Long story long, it was hard. After almost 4 years of of secondary infertility, I gave birth to my happy Sonny in September of 2016, thanks to miracle of IVF. He is the best and I love my kids. I would be lying through my teeth if I didn't say the mom life is a humbling and challenging experience! But after everything I've got to do, it is still the coolest thing I've done so far. I'm juggling, dropping so many balls, but turn up the music and boogie with my kids. with my kids and just trying to do my best. I think I used to think I wanted that big T. Swift success, but as I get older I don't really want to be famous that bad, I just want to dance, I just want to sing, I just want seek joy, and I want to share joy, with anyone and everyone, because it's fun, because it's healing, because it feels right. Mainly I just want to help others feel less alone. BONA FIDE CONFESSION: After almost 33 years of self-hating, I finally like myself! Tiffany, known as Crystal in the music industry will help us end the night by serenading us with a few of her songs outside under the lights. 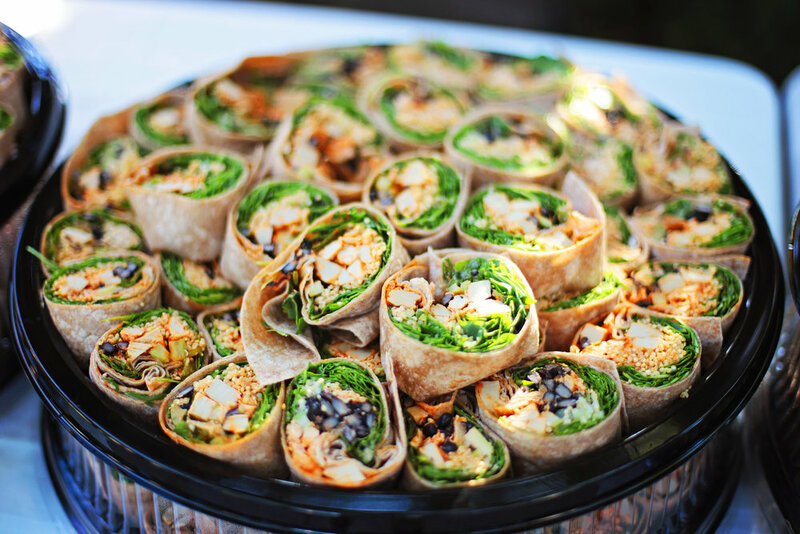 We will provide Perfect Bar's and Suja Juice to get you fueled and ready for our yoga/mindfulness session. BONA FIDE CONFESSION: "I am terrified to fall in love again. After years of recovering from unhealthy relationships, I'm scared to lose myself and all that I've accomplished. And at the same time, I worry that this fear may keep me from starting a family of my own." Courtney is a practicing Acupuncturist & yoga instructor in Rancho Santa Margarita at Lotus7 Yoga, Pilates and Lifestyles Center. This yoga studio and wellness center was voted "Best of Orange County" Yoga & Pilates Studio 2 Years in a row. Courtney's focus is to educate patients that pain and illness are the body's way of telling us to pay attention. Listening to the body, slowing down our busy lives and having compassion for, and finding congruency in, our minds and bodies is how true health is attained. Our optimum health cannot be achieved by pharmaceutical and insurance companies pushing temporary symptom relief treatments, but by educating ourselves and becoming attuned to what our bodies truly need. BONA FIDE CONFESSION: I start a new diet every Monday... and fail the very same day. I have been a photographer in sunny San Diego for 11 beautiful years! I am excited and grateful every day to be doing the job that I LOVE while raising my 3 amazing children. Born and raised in Utah Skye Amanda has always been in love with photography. The ability to capture a moment in time fascinated her from a young age. Skye Amanda turned her bliss into a business after graduating high school but between university, internships and part time jobs she hasn't ever taken it on full time. She says maybe one day she will. For now, she's hoping to just make people feel beautiful one click at a time. We're Gabriel and Marissa Rascon your duo behind Reel Rad Films! We're a husband and wife filmmaking team in Los Angeles, CA. We met at our church back home in Fresno, CA and married 10 years later in 2015 (whoo!) We feel blessed to continue living our calling through filmmaking. We believe there is no greater feeling than living your potential and sharing those experiences with others. Filmmaking is an extension of our heart, and we want you to feel empowered, inspired and in awe of your story when you watch your film. Our style is for the non-traditional, urban, unique, adventure seekers. Capturing those unposed, candid and intimate moments give us LIFE!